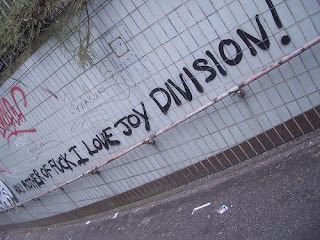 It's been a while since I've done this, but I've been listening to Joy Division for the entire day. I can't honestly say I've ever forgotten how much I love them, so it must be that I rediscover their awesomeness each time I have a JD Day/Week. I'm thinking my favourite song might be Disorder. Or at least it's in my top 3. I was thinking about how the same music can mean such different things to each individual. One major thing about JD for me is how they've changed how I listen to all music - it was only after I became a JoyD Junkie that the bassline became the predominant sound I'd hear in every song. Because Peter Hook's bassline is epic. Or like how I will always have a secret soft spot for Fall Out Boy because it was their cover of Love Will Tear Us Apart all those years ago(I think it was '03)that led me back to the original. And it was, in turn, JD's cover of Sister Ray that led me to Velvet Underground. Joy Division is also why I got into vinyl - my very first LP was Closer. An original, even. I'd been listening to nothing but JD and thought there had to be a better, perhaps more intense way of hearing these songs that I loved. And I suddenly fell in love with records. It's beautiful how it all works.